I may not have mentioned this before. Unless otherwise noted, all products reviewed on this blog are purchased outright and are not provided by a manufacturer or retailer. The Merrell Trail Gloves are no exception. I researched these shoes on sites like Barefoot Running University and compared them with other models on the market. I then prepared to write a review after researching and testing equipment as I would any other purchase. So if you want the short version, or if you don’t have time to read the rest of this post, go out and buy a pair of Trail Gloves right now. You won’t be sorry! If you couldn’t tell, I am crazy about these shoes. Ever since I reviewed Vibram Five Fingers last spring, I’ve run and cross-trained “barefoot” with nice results. VFFs feel great and allow a martial artist to move, and especially kick, in the most natural ways possible. However, I was never crazy about off-roading in VFFs. Running on grass, dirt, and mud? No problem. Even gravel and pavement are fine. On the trails though? Maybe I’m just a wimp, but after one or two sharp rocks, I was ready to turn around. This isn’t so with the Merrell Trail Gloves, a shoe with an especially apt moniker. They’re great on the trails thanks to the Vibram sole, which feels a lot like the VFF’s. Since they’re a closed shoe with a little more padding, you can feel the ground surface almost as well as VFFs, but the bottoms of your feet and toes are much better protected. Traction is aggressive, and I felt confident running through wet and muddy conditions. 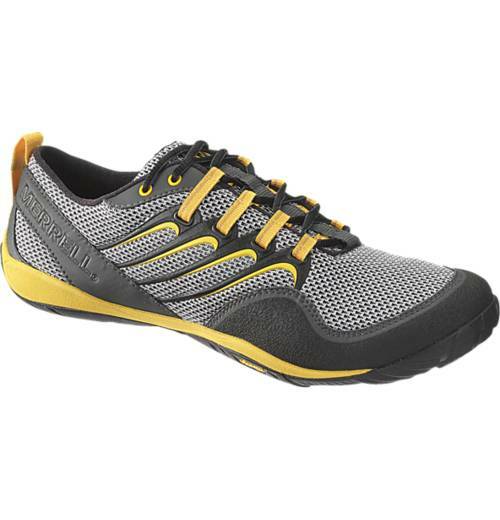 The Merrells feel great on the feet as well; thanks to the slim lining and tight lacing, they truly do fit like a glove. Wearing without socks is comfortable, though they’re a bit scratchy at first. They do fit well right out of the box and require no breaking in. The only cons I experience with these shoes are that they’re a bit narrow with a pronounced plate in the midsole. It’s meant to protect against jagged surfaces while maintaining the fit and flexibility of the shoe. It succeeds on both accounts, but it’s a little uncomfortable for my flat Fred Flinstone feet. I found that lacing them more tightly over this section prevents extra play and possible blisters. They are also not as good as VFFs for martial arts training due to the stiffer feel and the closed forefoot. You may even prefer wrestling boots for katas or grappling work. Overall, Merrell Trail Gloves provide the barefoot feel of other minimalist shoes while providing more style and protection. I originally bought a size 11, and after running on and off road, cycling, strength training, and doing yard work in them, I decided to buy a second pair to wear casually. I opted for an 11.5 for this pair: they are a little more forgiving in the midsole, have a more spacious toebox, and leave a little more room for socks. Both pairs still smell new, and they’re machine washable should they get that “not-so-fresh” feeling. I’m glad I went with the Merrell Trail Gloves. I also tried the New Balance Minimus. These have a more traditional running-shoe feel, and you might even prefer them if you’re not used to barefoot-style running. Have you tried any new shoes lately? Let us know what you think! This entry was posted in Equipment, Reviews and tagged Barefoot running, Merrell Trail Glove, New Balance Minimus, Vibram Five Fingers. Bookmark the permalink. goods of excellent quality! Shipping to Russia 25 days! No smell! ALL SUPER! I’m happy!thanks. The transaction comes. Premium and expense. Wife really liked.